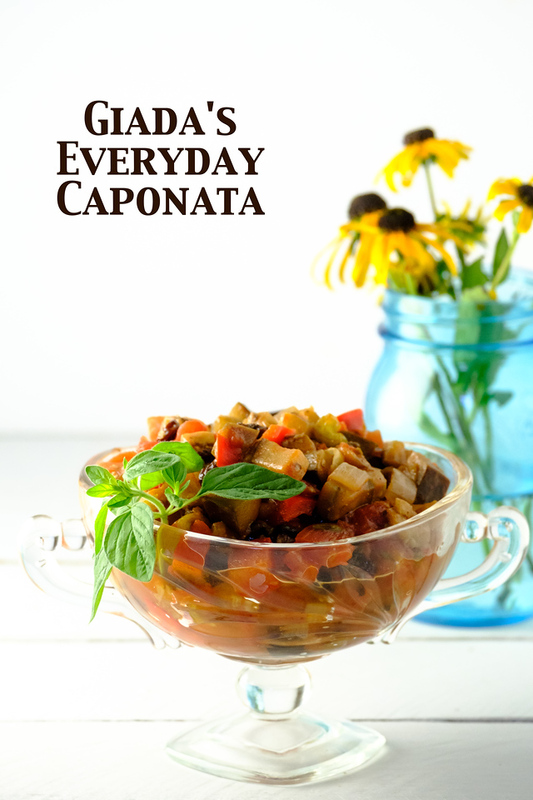 This Caponata is so easy and delicious! It makes a great healthy snack or appetizer, perfect for game day! Served over polenta, it’s a great light lunch or dinner. 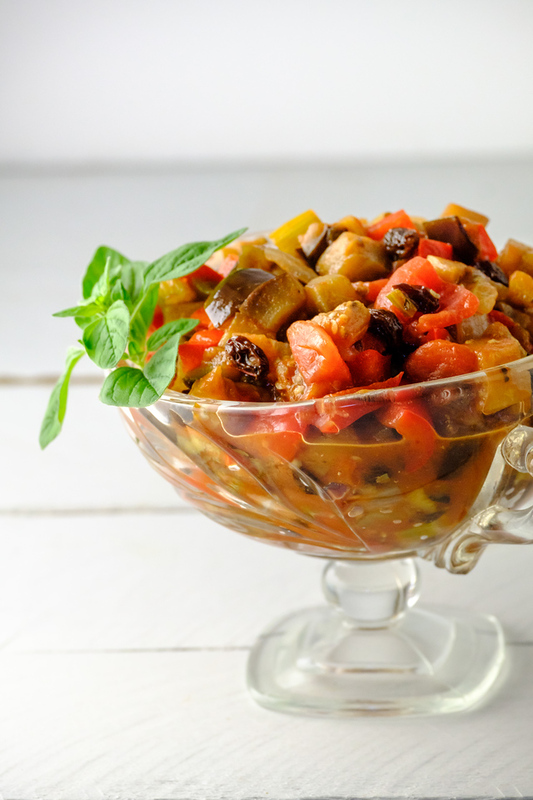 Click here to pin Giada’s Everyday Caponata now! Healthier Appetizer or Light Main Dish! I admit it, I am not very social. When I go to parties, you will typically find me standing next to the food table. Munching my way through just about everything. I’m not very good at small talk, but I am very good at eating! I try to pick and choose a few healthier items in between the massive amounts of cheese that I consume. 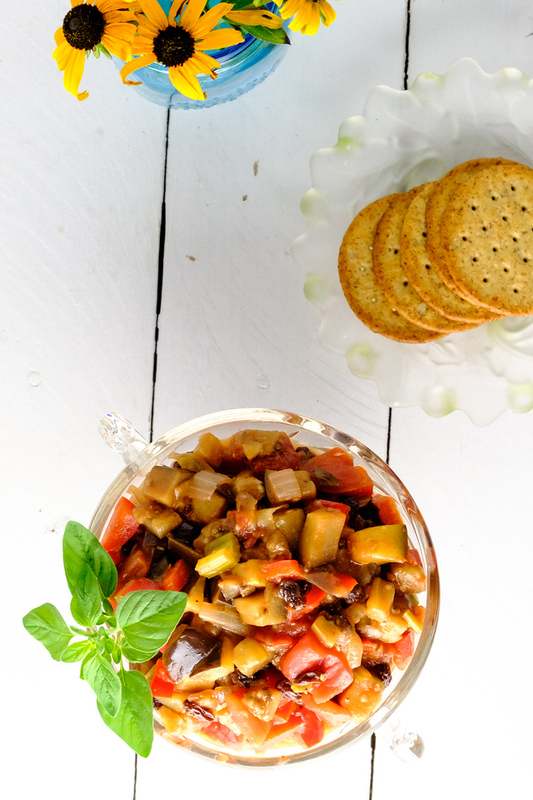 One of my favorite healthier snacks is Giada’s Everyday Caponata! I made this because my CSA kept giving me eggplant and I don’t like eggplant. Feeling guilty for composting it every week, I searched for something to do with it and found this recipe and thought I’d give it a try. Sicilian Recipes are so Good! Giada explains that this is a classic Sicilian recipe. Apparently I really love Sicilian recipes because I loved this and I also loved Tyler Florence’s Sicilian Style Spaghetti. I really like the use of raisins in savory dishes. They bring a subtle sweetness. This was so good. A little sweet and a little tart. I’ve made this many times. Sometimes it’s a game day snack with crackers or chips. I’ve also served it as a meatless main dish with it spooned over polenta. You serve it at room temperature, so it’s great for lunches and to make ahead! I found this in the first Giada cookbook that I ever bought: Everyday Italian: 125 Simple and Delicious Recipes. I’ve since added Giada at Home: Family Recipes from Italy and California and Weeknights with Giada: Quick and Simple Recipes to Revamp Dinner. 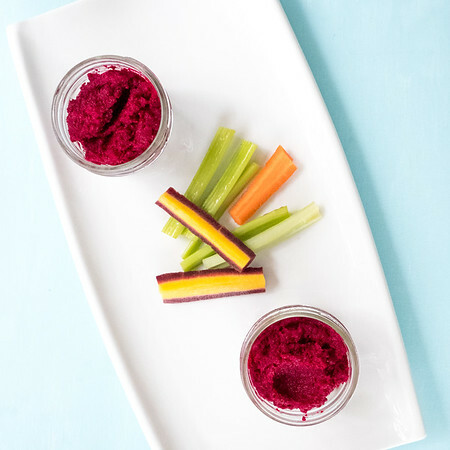 This Roasted Beet Hummus is gorgeous to look at, healthy and delicious! 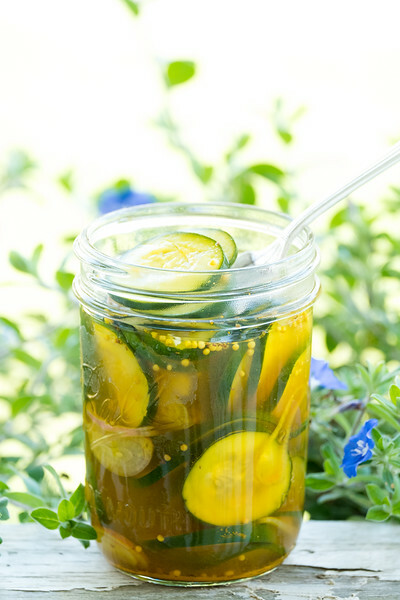 Pickles are great for game day, especially when they are homemade, like these easy Refrigerator Bread and Butter Pickles. Delicious and healthy snack or appetizer! Serve over polenta for a light lunch or dinner! Add the celery and saute for about 2 minutes. Add the eggplant and saute for 2 minutes. Add the onions and saute for about 3 minutes. Add the red pepper and saute for about 5 minutes. Add the diced tomatoes and their juice, raisins and oregano. Simmer over medium-low heat for about 20 minutes. The mixture should thicken. Stir in the vinegar, sugar, capers, and the salt and pepper. Season with more salt and pepper to taste. Serve at room temperature, garnished with fresh basil leaves. 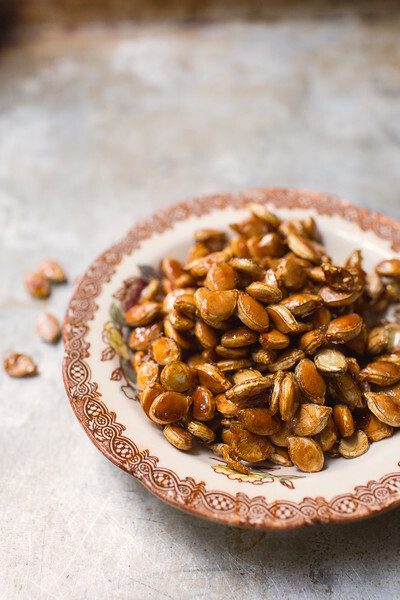 After carving your pumpkin, save your seeds and make these addictive Sweet and Salty Roasted Pumpkin Seeds! How much onion? It’s not mentioned in the ingredient list, but is mentioned in the cooking instructions. Thanks! Oh, so sorry! It’s one onion! This looks like such a healthy and tasty appetizer idea! I think I need to give it a try! You do! I love it and I don’t even like eggplant! I have to admit I have never heard of Caponata. But, I’m intrigued. It looks amazing! Oooohhhh this looks so good! Anything with capers and I’m sold! Looks like a great healthy recipe that will be even better than the usual football food shared at weekend parties. I like the idea of a CSA and need to look into that for my area. Perfect for snacking during football! What a lovely healthy appetizer idea! We all love cheesy appetizers, but it’s good to have some healthy options too! I would make this again, without wine vinegar..too sour for my taste..
That looks so good! I like all of the vegetables in it! As a completely unbiased individual (ahem) I have to agree with you that Sicilian food is great. I’m pretty sure it IS the sweet and sour that makes it so good. And all of that balsamic vinegar doesn’t hurt, especially if it’s the good stuff. I love caponata after making it myself the other day. I love how we both served it over polenta! I would love to try Giada’s variation to compare and contrast. With a nice glass of red wine, eating at an angle will surely be a possibility for me. Pam, thanks for the link-love and I too enjoy Sicilian cuisine as it has many similarities to Greek cuisine. Enjoy! My all time favourite Sicilian dish is Inspector Montalbano. Mmmm……. scrumptious! Well, you definitely managed to catch its good side, as that looks excellent! I like that you recognize that a little knowledge is a dangerous thing, yet you press on. I like the confidence. I love Italian food, and Giada. And eggplant is a definite fave. Looks delish! I will have to try it sometime. Yes, some dishes just don’t like the camera, no matter how many garnishes you put on them. But I still think this looks yummy. The colors are perfect for this time of year! I know- isn’t it annoying when something tastes fabulous but you don’t like the finished photo? (Although I don’t know what you are complaining about- your photo is wonderful.) Giada has done it again- I really do like a lot of her recipes. looks pretty photogenic to me, pam! that polenta is so fresh and so smooth, smooth, and the veggies atop it are luscious as well. the end. Yum! Your photos are getting better by the day, Pam! Eat at an angle.. LOL! Looks great. I never even heard of caponata. I guess I need to get out more. Or else, you can do it for me, and write about it. And who cares if you forget the garnish? The picture was pretty anyway! Eat at an angle. Only you would come up with that. You never fail to make me smile.